We put our wet gear on, in the wet, behind the car. Maybe if we have a lengthy tea break it will clear up? It did too, someone is listening and took pity on us. First, tea and doughnuts all round. So, for 30 days' fishplate greasing, I will get a certificate? It was a large and jolly crowd, that soon split off into various directions, encouraged by the increasingly sunny clime outside. 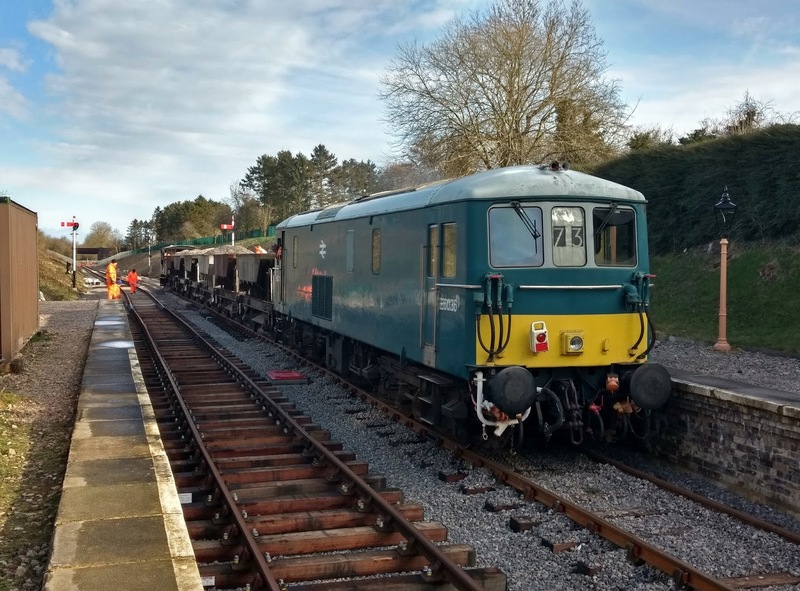 Two teams went to Winchcombe, one to load up the Landie with some gear for Broadway, the other to work in the yard - result not known as we go to press. 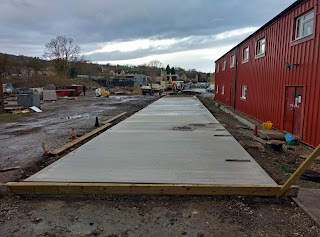 As we passed through the yard, we couldn't help but noitice the fabulous concrete driveway being constructed. Here is the finished bit, outside C&W. 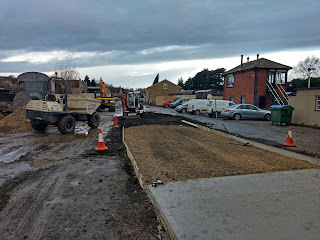 It was being laid in sections, and today Wednesday the next section, just south of the C&W building, was being prepared. Because of all the work and manoeuvering with contractor's vehicles, there is very little space, so the advice is to stay out. Hence the forecourt car park was chocka, and it wasn't even an operating day. There was quite a bit of debate about fishplates, fishplate bolts and nut runners, until we finally took the Landie off to Broadway, as at 11 o'clock the first of two ballast trains was expected. Bowling along the B4632 at 10.50, we were astonished to see the first one already on the extension, trundling along steadily and us several minutes behind. 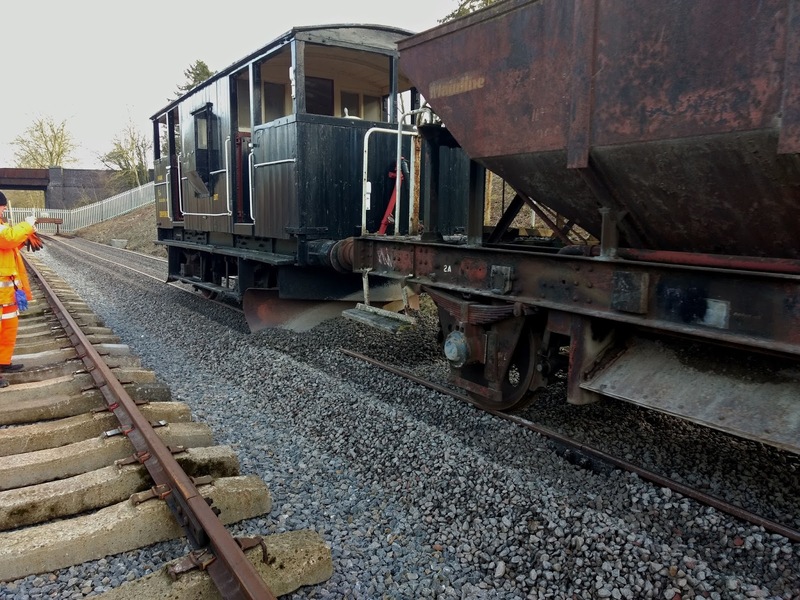 We bolted up the car park slope to the site safe and fell out of the Landie, just as the ballast train arrived at the goods shed. Phew - made it! 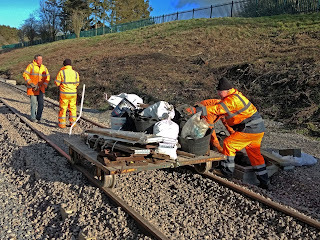 The tools we brought up were transferred to a Permaquip trolley and taken to the bufferstops, where there was an outstanding issue with two fishplates. 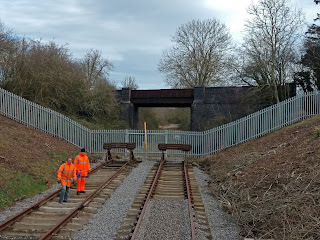 One gang then replaced and bolted up a pair, and spent the rest of the day adding additional bolts to the siding, and part of the headshunt. The other gang at Broadway mounted the train and was propelled slowly all the way through the station and up to the headshunt. You can see that another ballst run was effected a few days ago, this drop still being fresh. 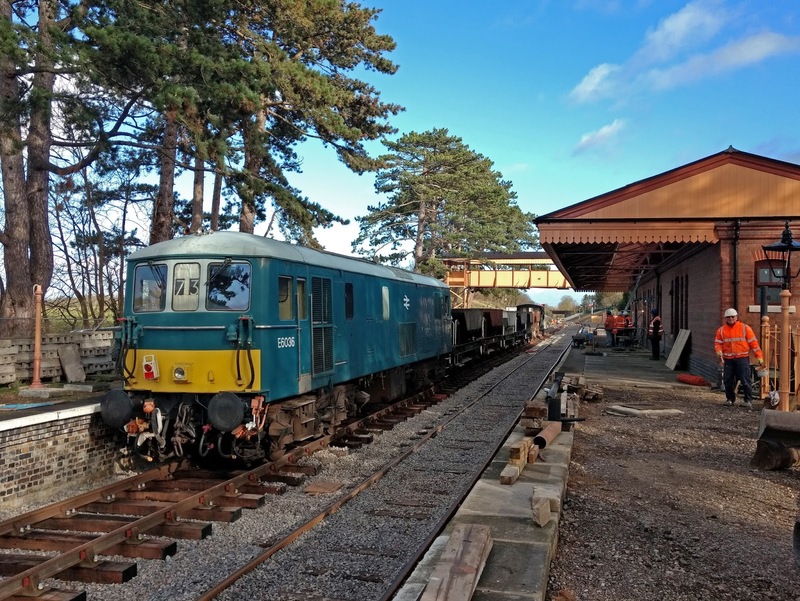 The train was shunted right back... right back... not too far, we hoped, that bufferstop can't afford to be buffered up to yet. Well, at the end of the day it could. Let's hope they are there only in a temporary fashion, and that we can think about the next extension, once we have digested this one. The purpose of the reversal was to drop the plough, put the (highly professional) old car tyre under it, and sweep the drop made last week. With the tyre on, the plough becomes that bit more efficient at turning inside surplus ballast to the outside. It saves work for the regulator. After using the plough, we did several more 'spot' drops along P1, starting as here at the northern end, to get a smooth drop all the way through. As we enter the platform, you can see that the first Dogfish has already been emptied. With the train crawling through the station, there is an opportunity to photograph it under the footbridge, in lovely spring colours. We then made it through back to the southern end, and had a pow-wow about where exactly to drop next, and from which wagon. P2 was selected, which meant moving the points. All have now had their tie bars fitted, so they are usable, albeit by means of a crowbar. 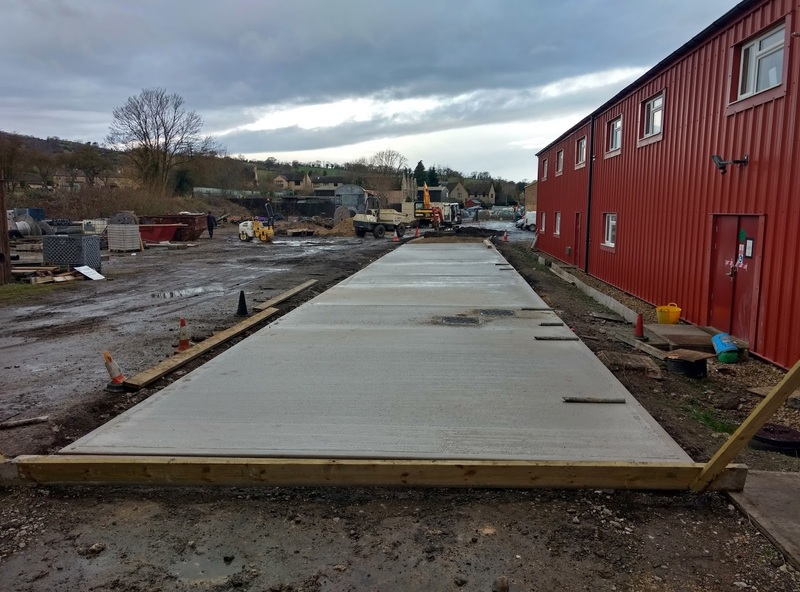 Not for long though, check out that ground frame that has arrived here. S&T are on the ball. Then it was back through the station, with the SHARK leading and the class 73 pushing from behind. This is Broadway in the spring. 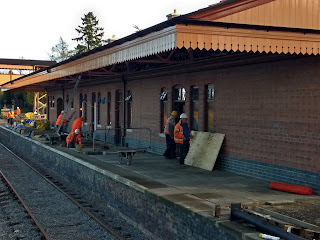 The lamp tops fitted to the posts on the left were taken off again today, and fitted to the remaining empty posts along platform 1. 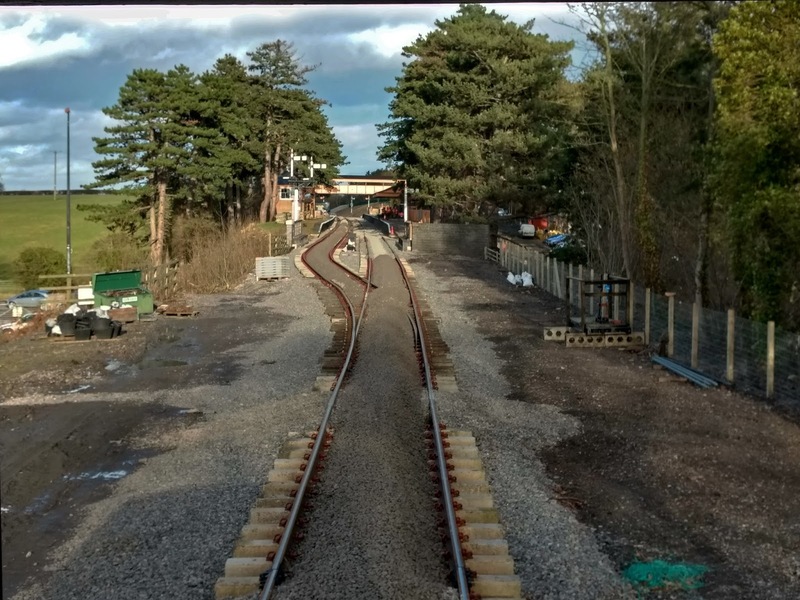 We don't actually have enough lamp tops, and priority for time and expenditure is to get the basic station finished for the opening, which is approaching with giant paces. 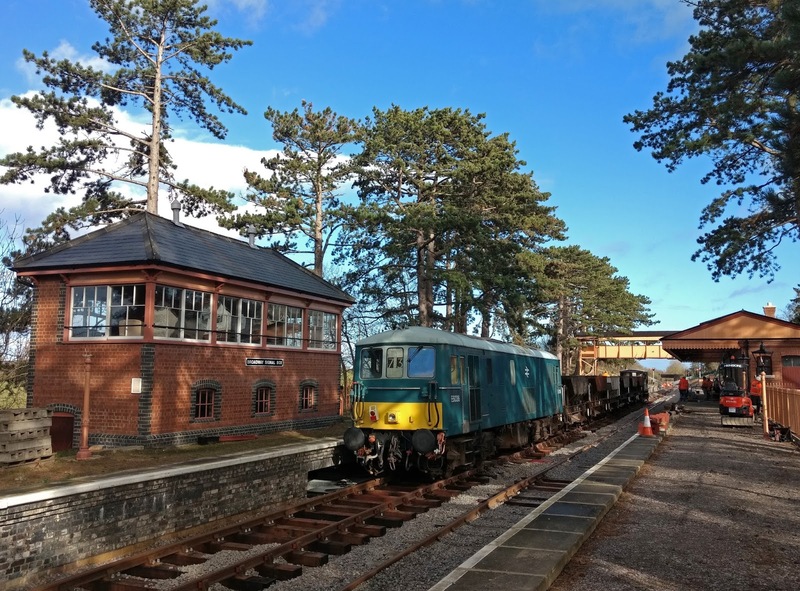 As you trundle slowly through the station, you get a grandstand view of the frenetic activities there. Placing of the platform 3x2s was progressing well; they were about half way today, having reached the door to the booking hall. This platform surface quite transforms the look, and it is just like it used to be. 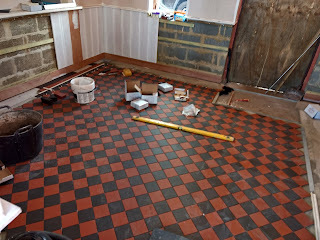 A glance into the booking hall shows that the clay tile floor is almost finished. There's a change of pattern to straight tiles round the edge, and all in all it's very Victorian and very convincing. The white wainscoting at the back will be dark brown; the walls above cream. Back to the ballast train. 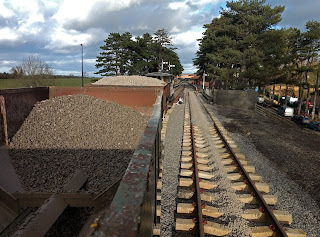 We shunted it up to the turnout for the up siding, then slowly did a centre drop, one wagon at a time and without the plough. 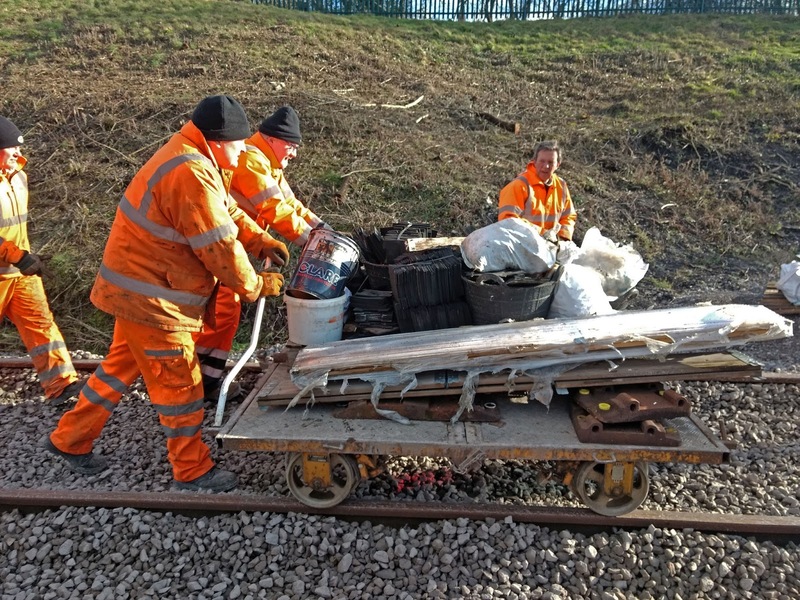 The final distribution will be done by mini digger, and this modus operandi is used to avoid dropping too much between the platforms, which we want to avoid as it's difficult to cure. Here the class 73 peers out from under the HIA footbidge, having just emerged from the shadows. These few images of the train slowly pulling through P2 are all extra large as they are colourful, striking and indeed unique. 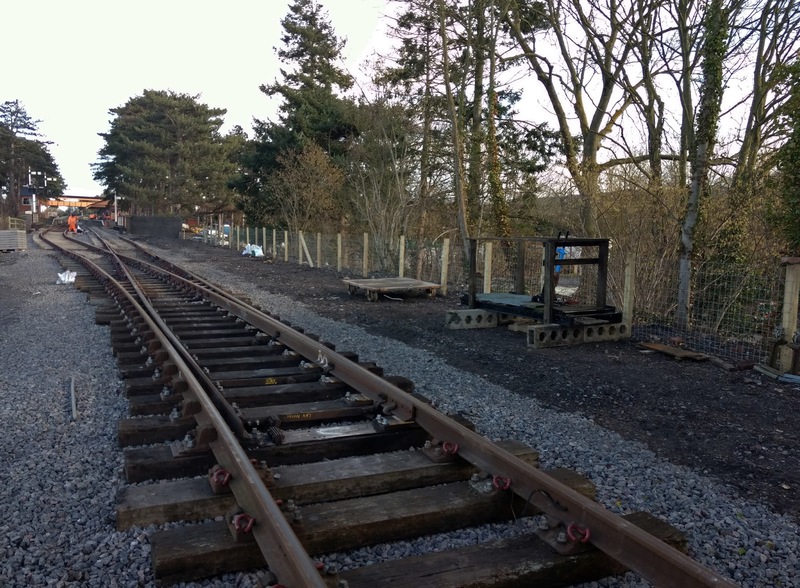 In future service trains will obscure this view, so feast your eyes now. A last 'extra large' shot of the train as it passes the signal box. 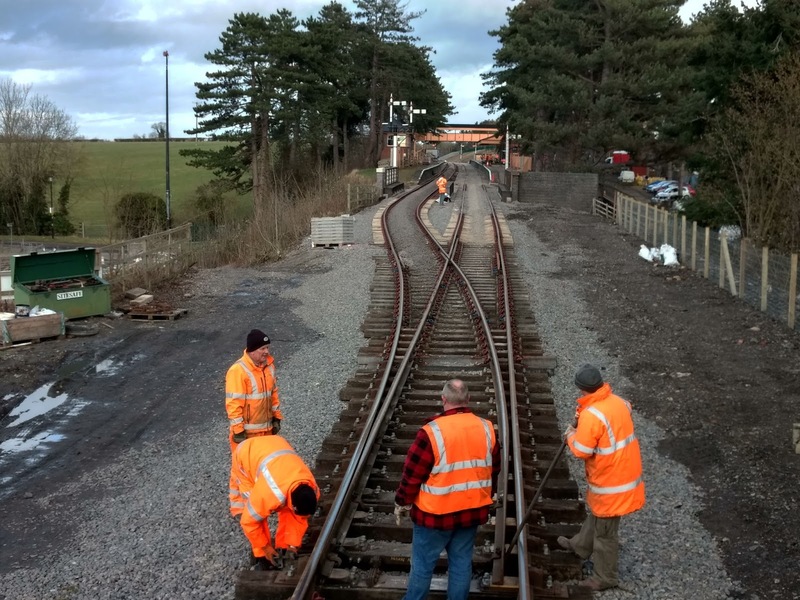 We built this from the ground up, using just an old photpograph, and our knowledge of GWR type 7 signal boxes. Isn't it fabulous? There's still a little spearhead gate to go in on the corner to close off the access to the locking room, and of course spearhead fencing along the replica lamp posts. That's for another budget though. Here is a little 'before' shot of the bell cranks and rodding leaving the box to head north. 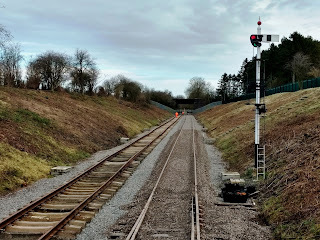 We beg S&T for forgiveness, but unfortunately the ballast drop along here rather filled in the channels they had dug through the sleepers to the other side. Sorry ! 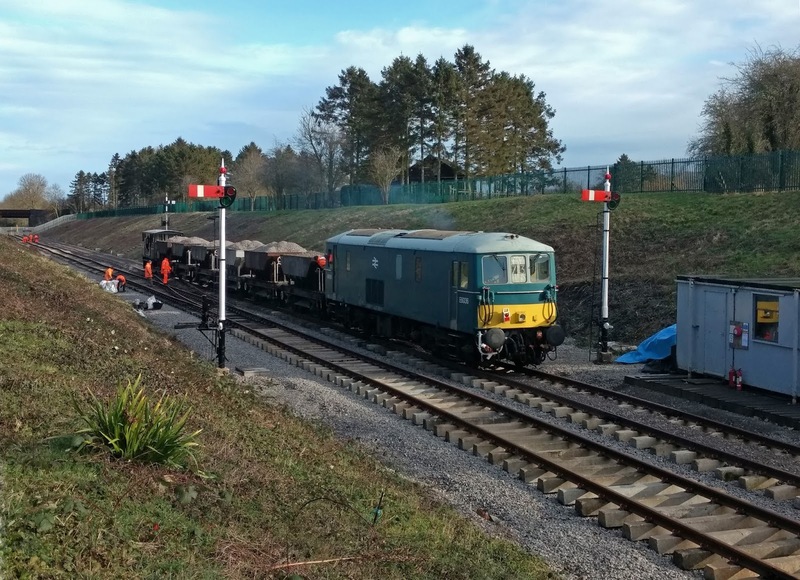 In mitigation we would like to say that a member of the S&T dept was at the controls of the locomotive. One by one the Dogfish were emptied along the up line, the last one here just discharging itself as we reached the southern turnout. The down line on the right still needs a load dropping on it, but - we have another Dogfish at the back! How's that for planning. 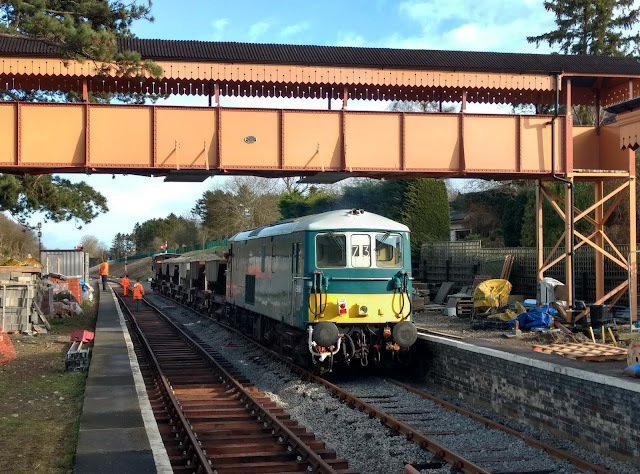 With the train and the last loaded Dogfish safely back over the southern turnout, the ballasting gang lever the blades back to the through line position. Soon we will be a able to do this with the ground frame. And there we have it, all done. Fresh ballast through Broadway, doesn't it look neat. It still needs further distributing by mini digger, ready for the tamper to do its job. We have booked it for the 20th. 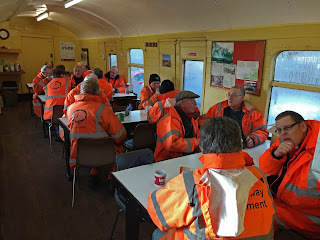 Mustn't forget the fishplate gang at Broadway though. 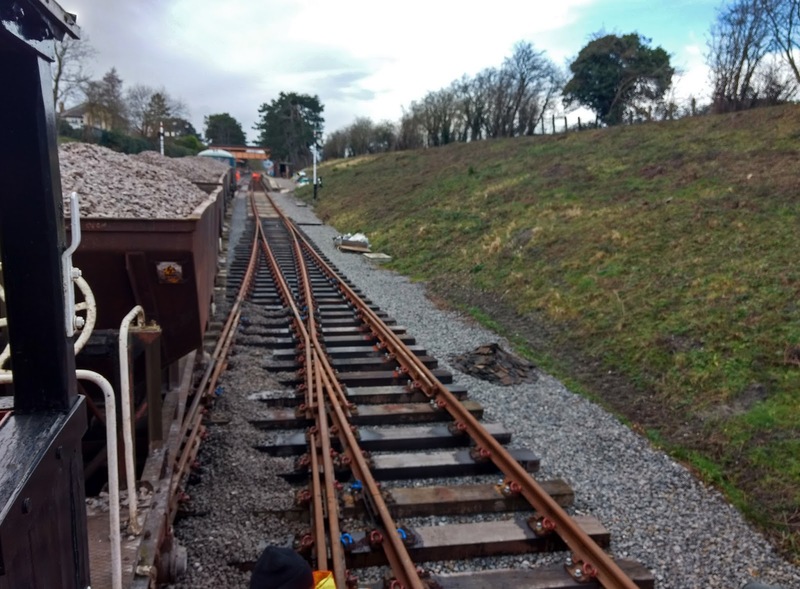 While we swanned around on the train, they had the hard job of fitting two new sets of fishplates to the down line buffer stop, and adding additional bolts to the up line. 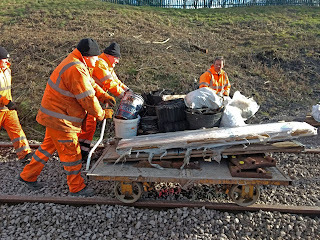 At the end of the day, having run out of bolts, they also ran a site tidy up trolley along the line. We're not going to leave anything behind. The trolley ended up being quite heavy to push. On it were two 60Kg base plates for example. It took two of us to shift them. As we left, we passed the newly repaired Broadway station road bridge. What part of 'LOW BRIDGE' did you not understand? 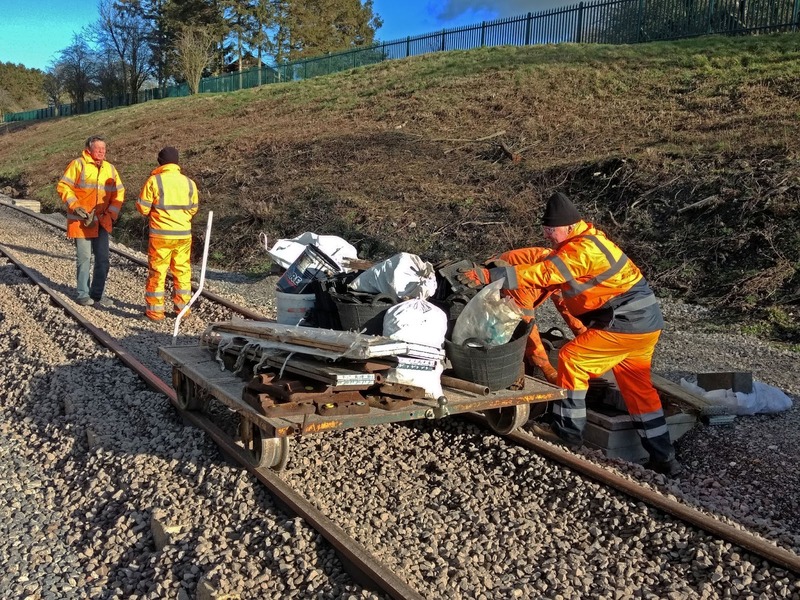 We'll forgive you for filling in the signal wire channels between the sleepers - we have just the man who loves to shovel ballast! Many thanks for the post and the latest news. It's wonderful to see Broadway in the sunshine. Everything looks different. 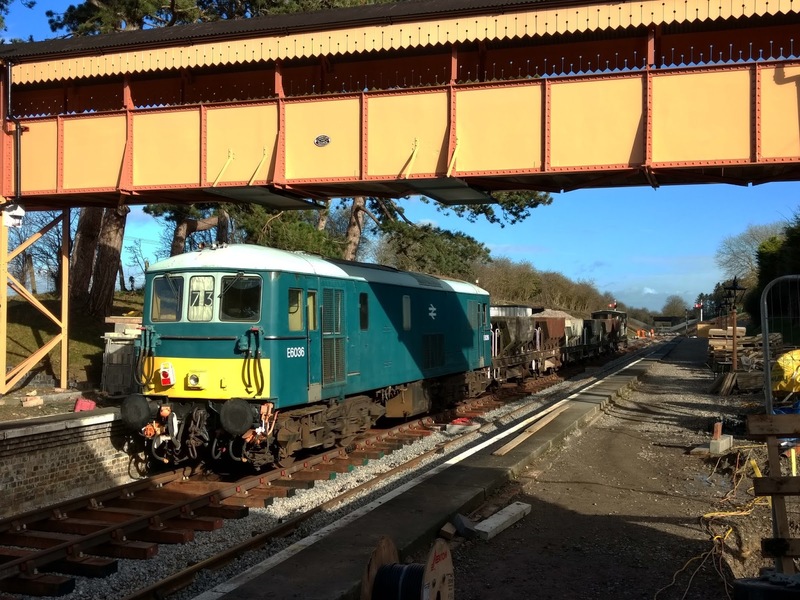 Well done with the ballast drop. (Yes I've read Curly's comment. They have a man who loves to shovel ballast, he says ! ! S&T have hidden depths.) I have to say you seem to be getting through plenty of ballast. Another drop or two, yet ? Well, if it's needed, so be it. Changing points without even a lever frame ? Rather you than me, but you'll soon have a lever frame. Is that right ? Well, I hope you soon can tell us about it. 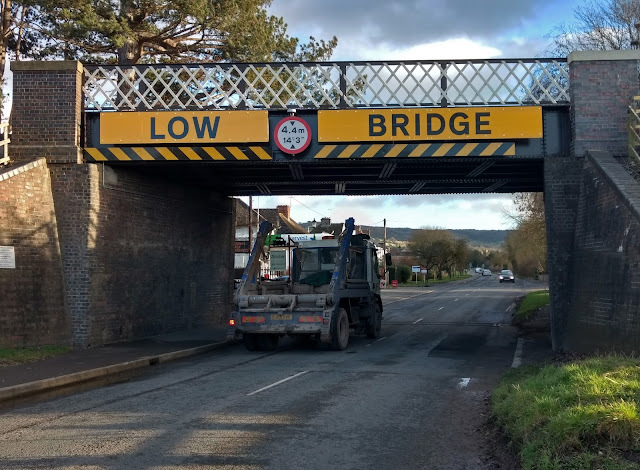 I particularly liked the picture of the bridge with a lorry (a very nice lorry, probably being driven by a very nice man,) passing safely underneath. Not bad, so far ! I would say, roll on the summer days, but tomorrow being February, you probably don't want the days to roll on too quickly. Not with an Easter opening looming ever closer. 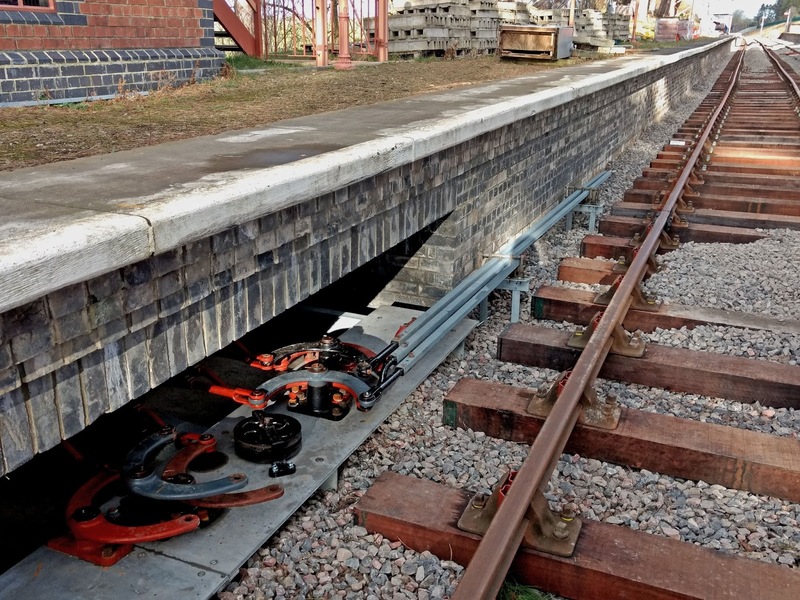 I hope you'll have no problems with track clearance between the platforms at Broadway, after they've tamped the track. That's the last thing you'll need. Good luck with it. Again thanks for all the news. It's great to see sunshine and a great deal of activity. Hark ! You will be pleased to hear it's just started raining again here in the North West, and it's rally chucking it down, lashing against the windows. I'm glad I'm ! indoors ! Regards to all the PW team. They're a wonderful lot. Yes indeed, when the Russians said "Generals January and February will fight for us" they meant it. I have tremendous appreciation for the work being done on the extension and the station over winter, especially given that the forecast for much of February is bad, cold with some snow for next week for example! Broadway Station is somewhat sheltered but bad weather doesn't help anyone, especially if there's a deadline looming. Keeping my fingers crossed. I had to leave a positive remark about the beautiful tile job in the Booking Hall. It looks magnificent! Reproducing the past can be very rewarding. And worth every penny. I indulged this same policy in the 90s in Cumbria. Happy days. 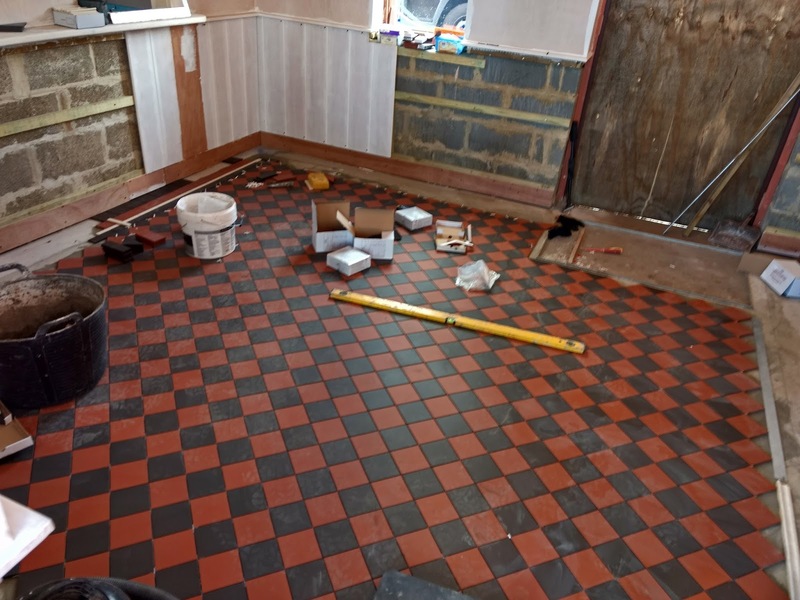 I just wondered about the description 'Victorian' that Jo used on the floor tiling. The station is Edwardian though, isn't it? The Victorian era ended in 1901 and Broadway station was built in 1903. So it was built in the very early Edwardian era, but, I would say, with designs from the late Victorian time. Cheltenham Race Course platform waiting room has integral toilets. Toddington Ted. 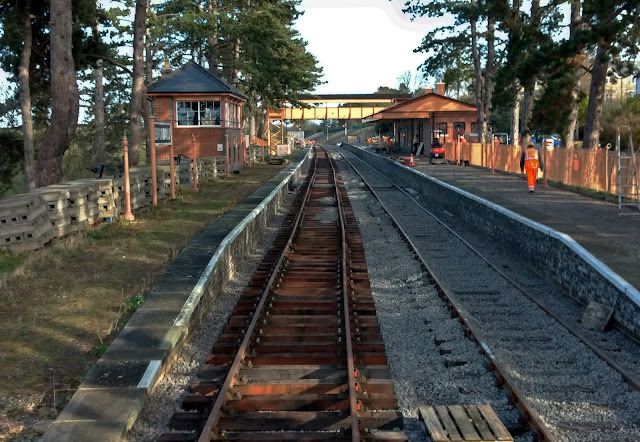 Will it be possible, before the opening of the station, for all the cable troughs to be moved off platform 2? 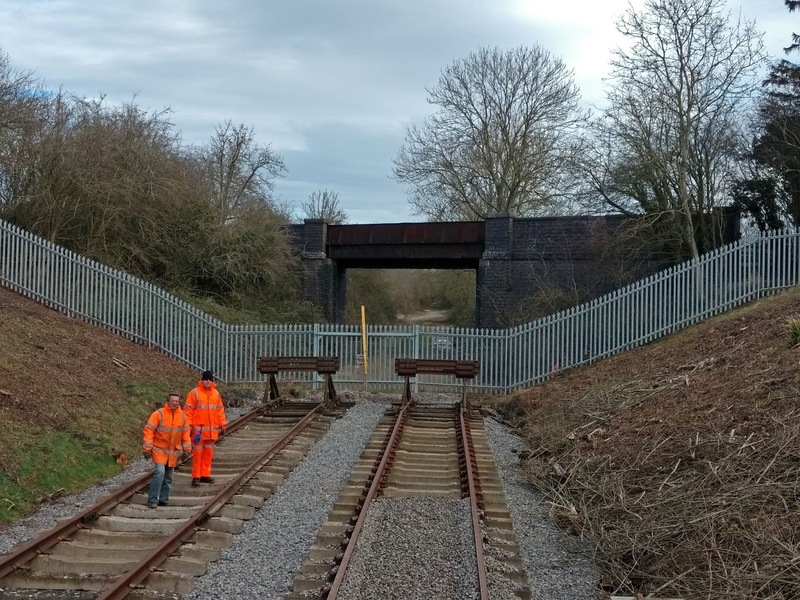 Perhaps they could be stacked over the bridge out of sight on the piece of spare ground before the turn out? The cable troughs belong to the S&T dept. I suggest you put this question to them on their blog. They are certainly what the public will see when they stand on platform 1. Excellent blog Jo. The sunshine does make everything feel so much better. Not down here though; we started off with hail - GREAT BIG PIECES OF ICE falling from the sky; and again later in the afternoon! It is now raining yet AGAIN! 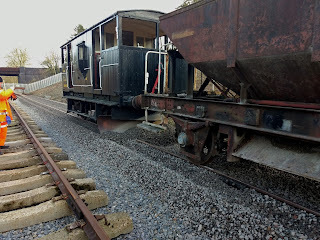 Well Jo, another load of ballast and work done towards getting the new "Lady" ready, she looks better with every blog report and pictures! Looks like you all will end up with overtime to get the job done in time for the official opening and then the start of the season. We can't wait to get over to see the station. BTW who gets invited to the official opening? A thought about the low bridge, you have the security cameras on the HIA bridge, could you do the same on the road bridge and catch perpetrators that way? With full power up and running at the station, there are some great ways of capturing images to a storage device in the office. Great work guys, looking forward to visiting in April. Jo - Great blog. 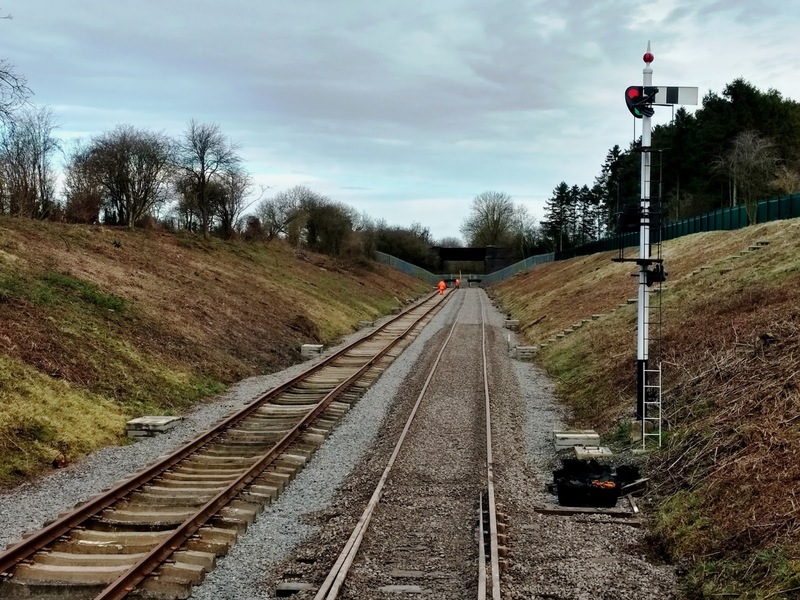 With so much ballast being deployed by rail, do you have a picture or blog entry showing where / how the dogfishes are filled - for the last 4-6 weeks they seem to be filled as if by magic! I assume this is delivered by road, piled up in a heap, Toddington way, and then loaded by JCB into each dogfish ready for deployment the next week. Is this the case? It's good old Steve again, with a 360 at Stanton. We own a small triangular slice of land there, just big enough to let a lorry in and dump its load next to the track. It takes an hour to load 6 Dogfish with the 360, more than twice as long with the JCB, so we don't use that so often.